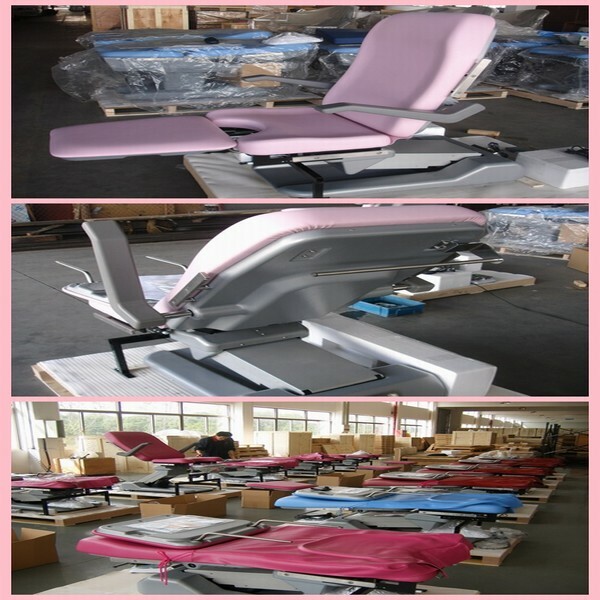 a) This multifunction obstetric table is designed and manufactured to meet the need of the medical enterprise. It is used for childbirth, gynecology surgical operation, examining and many other functions, including caesarean operation. b) The ascent and decent of the whole set is controlled by the electric push rod, with the foot switch to make the platform top rake and back slope and the back board rise. It has the characteristics of convenient operation for the divorcing, stretching and drawing of its plug-in auxiliary table. The platform is made of froth polyurethane, wrapped seamless. The table is moved by the foot pedal control. c) The planks, basins and all outer shells are made of stainless steel, which makes nice appearance and easy cleaning and sterilizing.